In Greece, the percentage of population aged 18-64, which in 2016 was at the early stages of entrepreneurial activity (including self-employment), dropped at 5.7% (approximately 380 thousand people) from 6.7% (450 thousand people) in 2015. This rate - which is among the lowest recorded (2003-2016: 6.9%) - is below the average level of “innovation-driven economies” (2016: 9.1%), i.e., the majority of developed countries around the world, including Greece. Therefore, despite the stabilization of the economy in 2016, uncertainties remained strong affecting thus the level of entrepreneurship. 44% of early stage entrepreneurs in 2016, were new entrepreneurs (3-42 months in business), while the rest were nascent entrepreneurs. New entrepreneurs’ percentage is slightly higher than average in innovation driven countries and is systematically observed during the last years at this level. Therefore, it can be used as a quantitative target for enhancing entrepreneurship, as it proves that almost four out of nine early stage entrepreneurs actually make the crucial step from the initial preparation (nascent phase) to the actual launching of their venture (new entrepreneurship). 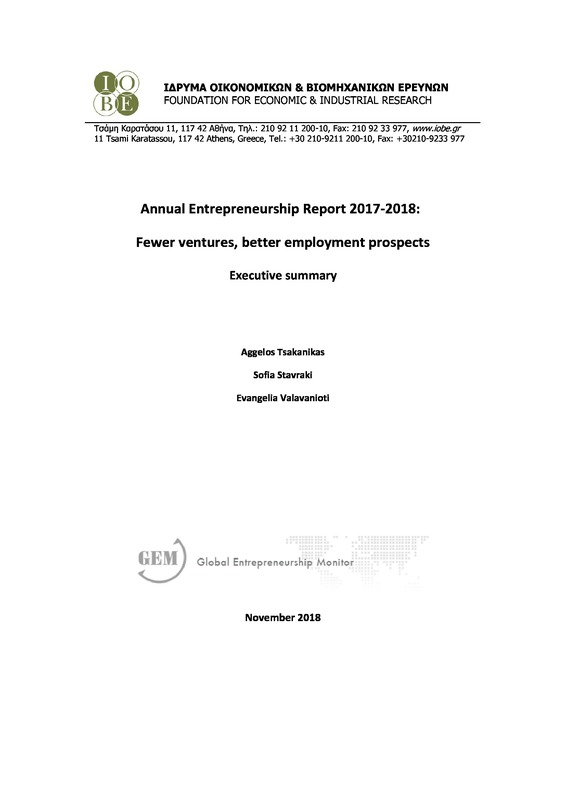 Taking into consideration the high proportion of established entrepreneurs, i.e., those already operating a business for at least 3.5 years, which in 2016 exceeded 14% (against 13% in 2015), then almost approximately 20% of Greek the population between 18 and 64 years old are somehow related to entrepreneurship, either at the initial or in the next phases of business activity. Due to the high levels of established entrepreneurship, Greece has the third largest performance in total entrepreneurship rates among the innovation countries. The percentage of population that during the past 12 months has sold, shut down, discontinued or quit a business increased at 3.8% (approximately 260 thousand people) against 3.0% in 2015, which is substantially higher than the average level of the innovation-driven economies (1.9%). Seven out of ten early stage entrepreneurs mentioned profitability issues as the main reason of business closure. This finding is closely related to the high early stage entrepreneurial rates, as in countries with numerous new business ventures many failures are also observed. Therefore, entrepreneurship policies should not only focus on the quantitative enhancement of entrepreneurship, as high start-up rates do not necessarily ensure sustainable entrepreneurship. Sometimes fewer businesses created in an economy yet with more qualitative characteristics can have a more significant impact and higher multiplier effect on the economy. 41% of early stage entrepreneurs (about 160 thousand people) are considered as necessity-driven entrepreneurs, while 36.1% of them (about 155 thousand people) are opportunity-driven entrepreneurs. The percentage of opportunity entrepreneurs was lower than the average level in the innovation-driven economies (55.8%), while the necessity entrepreneurs are 22.8% of the total. However, the percentage of entrepreneurs with opportunity driven motives was increased in 2016, for third consecutive year, which is related to some extent with the drop of unemployment during 2016. In terms of age, three out of four early stage entrepreneurs in the 2016 survey were older than 35 years old. Among them 36.5% were between 45 and 54 years old, i.e., almost 10% of the respective population (9% in innovation-driven economies). In general, the participation of younger people - up to 34 years old - in entrepreneurship is lower compared to the group of innovation-driven economies. High participation of very young people in entrepreneurship is not necessarily a disadvantage considering that the lack of experience mitigates chances for success. In general, in more developed countries new business ventures are mainly created by older people, whereas in developing countries younger people are motivated to entrepreneurship as a means of improving their livelihood. Female early stage entrepreneurship decreased at 4.8% (about 168 thousand women) against 6% in 2015, whereas male early-stage entrepreneurship dropped at 6.6% (about 200 thousand men) from 7.5% in 2015. Despite the decline of female entrepreneurship rates after three years of increase, the percentage of women in early stage entrepreneurship remains high (42%). This outcome is related to the higher unemployment rate and/or the need to supplement income in households where possibly male have lost their jobs. Besides, Greek women are more likely than men to be necessity entrepreneurs. Only one out of three entrepreneurs (36%) have tertiary education while 7.8% have a postgraduate degree. Approximately 43% of early stage entrepreneurs have a high school diploma, higher than the one in 2015. This is also a systematic evidence reported also in past GEM surveys. The pool of more well-educated people is not sufficiently motivated to entrepreneurship in Greece. The percentage of population aged 18-64 years who declared that they are informal investors in another person’s business venture is 2.9% (approximately 212 thousand people), slightly lower compared to 2015 but also lower than the average of the innovation driven economies (3.4%). About 84% of this type of investors are family members. The role of informal investors is substantial considering the problem of access to finance in Greece. However, in this case there is also a lack of professional assessment of the venture since no formal processes are used neither rational choices are usually made. Instead the decision to fund a member of the family may stem from emotional criteria, which jeopardizes regarding the quality characteristics, or the sustainability or the growth of the business. At the sectoral level, the increased proportion of early stage entrepreneurs in the primary sector in 2015 (12%) was not replicated, since it dropped at 7.7% in 2016. However, this rate continues to be among the highest over time in Greece. New entrepreneurial activities in manufacturing declined also, in contrast to the percentage of new consumer oriented activities which increased significantly. Therefore, the stabilization of the Greek economy in 2016 and the small increase in private expenditure strengthened the interest for business initiatives in the Retail sector. This pattern is similar to the growth pattern before the economic crisis and raises again questions about its sustainability as a growth model in Greece. Three out of five entrepreneurs stated that none (potential) client will consider their products / services as new, while the percentage of those who stated the contrary (i.e., all customers will consider their products new) stood at 15.6%. This finding may be associated with the fact that new ventures are mainly in consumer oriented activities where innovation is by nature more restricted. In the same framework, 55.3% early stage entrepreneurs believe that many firms offer similar products or services, compared to a similar ratio in the group of innovation driven economies (52%). It should be underlined, however, that the percentage of entrepreneurs who believe that they have no competitors increased to 10.5% in 2016 against 2.3% in 2015. Almost one out of three early stage entrepreneurs responded that they do not employ other people in their business, at least at the time of the launching, whereas 61% reported that they employ up to 5 people. Therefore, the majority of new ventures created in Greece start as micro firms, a pattern which is similar to other countries. Furthermore, almost three out of four early-stage entrepreneurs respond that in the next five years they will be able to create at least one job, yet most of them stated that these will not be more than five. Hence, new ventures in Greece start as micro firms and usually remain micro firms in a 5 years’ time span. This means that although in Greece many new ventures are created in the economy, in terms of employment the effect is minimal: new ventures seem to provide employment mainly to the owners. One out of three early stage entrepreneurs stated that their products or services address local needs. Almost the same percentage reported that at least 25% of their sales comes from external demand. This percentage rate is slightly lower compared to the average level of innovation driven economies (35%). This is however, a result closely associated with the large number of firms in the tourism sector and the related activities, which by nature are export-oriented. However, in 2016 we notice that the increase in the number of exporting ventures is accompanied with an increase in export intensity as well (meaning higher volumes): more than 70% of entrepreneurs report exports of more than 25% of their sales, which is remarkably high. The percentage of population seeing good opportunities for starting a business in the next six months remains very low (13% in 2016 against 14% in 2015). This is the lowest percentage worldwide and is closely related to the adverse economic conditions that still affect entrepreneurship in Greece during 2016. 41.7% of the population (against 46.8% in 2015) stated that they do have the knowledge, skills and experience required to start a business. This rate is almost double in the case of early stage entrepreneurs, where more than 70% believe they are capable of starting a business, indicating high level of self-esteem and confidence in Greece. Approximately 64% of population stated that entrepreneurship is a desirable career choice, whereas 65.9% stated that successful entrepreneurs have a high level of status and respect in Greece. This is one of the highest rates recorded since the beginning of the economic crisis. On the other hand, Greece has one of the lowest rates in Europe with stories in the public media about successful new businesses. Greece has among the largest rates worldwide with regard to the fear of failure factor, although such an upward trend has been reported all over Europe during the last years, because of the financial crisis. In Greece the effect of the crisis has been more intense, that is why it remains well above the long-term average over time and in 2016 increased further at the level of 70.4%. Early stage entrepreneurship by older people has become an interesting research field and a new policy area for entrepreneurship in Europe lately. Considering the demographic developments, the improvement of life expectancy and the quality of living the so called “third Age” is not a short and inactive period in people’s lives. Many of these people want to remain active and seek for new business opportunities, or share their experiences in case they already had a successful business. Besides experience, elderly people have - by and large - also developed a significant professional network, which can be very helpful when creating a new venture. Senior people they also can better evaluate information and knowledge from their business environment and come up with more well-informed decisions. On the other hand, they are usually more risk averse or less willing to seek higher returns, thus they are more conservative in their decisions. However, these people face some additional challenges in their efforts since are not the usual beneficiaries of the traditional business support mechanisms. Exploiting the capabilities offered by this growing category of people is also part of recent EU actions designed to develop policies that can take stock of the knowledge and skills of these individuals in order to become more involved in entrepreneurship. 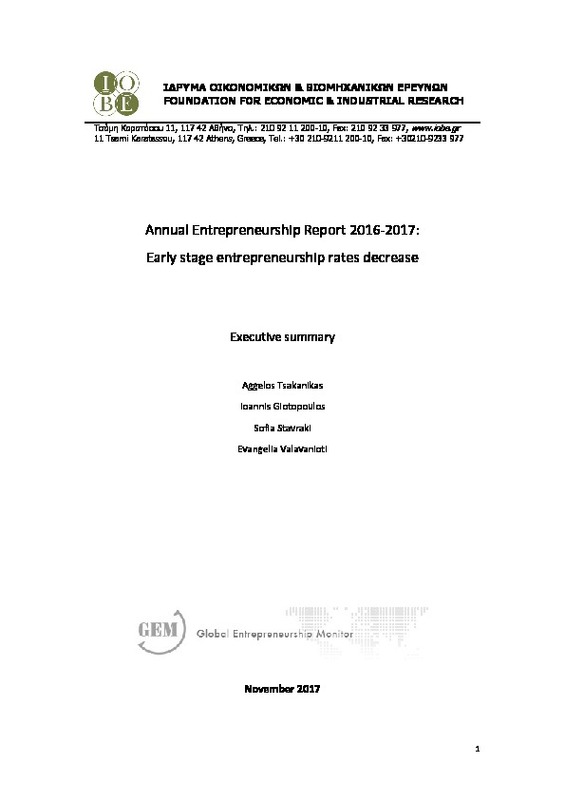 Considering early stage entrepreneurship in Greece a decline of new ventures in all age groups emerged in 2016, which is more intense in senior entrepreneurs where the respective index dropped at 5.9% against 7.2% in 2015 (4.8% on average between 2003-2016). Only one out of four early stage entrepreneurs over time are seniors, with necessity being the main motive for their entrepreneurial behavior. Respectively, women early stage entrepreneurs in this age category are more than men (53% against 47%), contrary to the younger age groups. At sectoral level, the majority of new ventures in all age groups start their venture in consumer oriented activities, yet a substantial percentage of new ventures by senior people (almost one out of three) is found in manufacturing when the respective percentage in middle age group stood at 17%. Paradoxically, senior entrepreneurs feel less confident to start a business compared to younger people. This might be also a result of the fact that 14% of elderly people in Greece have only primary education and were motivated by necessity. With regard to the adoption of new technologies in new ventures, middle aged or elderly early stage entrepreneurs use mainly older technologies compared to younger people. In the case of export activity senior entrepreneurs are more export oriented relatively to the other age groups since the percentage of those with 25% or more sales from abroad stood at 38% against 32% and 12% for middle-aged and young entrepreneurs respectively. Results from the national experts’ survey in Greece shows that during the 2016 survey, business environment in Greece remains worse than in most European countries in many of its dimensions. The low momentum of the Greek entrepreneurship is negatively affected by the economic crisis, yet it is mainly due to the structural problems of the economy such as bureaucracy, unstable tax framework and the limited or ineffective function of mechanisms to promote and support entrepreneurship. The main obstacles in business activity in Greece are associated with the lack of a broader framework of national policies for entrepreneurship, the inefficient policies with regard to the taxation of new businesses, bureaucracy and other factors such as the inefficient operation of public bodies supervising the establishment of new businesses. Entrepreneurship is also hindered from difficulties in accessing finance, high entry barriers and the broader political and social environment. According to the experts, among the main motives for entrepreneurship can be the upgrading of the educational level, mainly with regard to business development, and the implementation of actions that encourage entrepreneurship and provide incentives for start-up businesses. Therefore, actions and strategies should focus on schemes that support entrepreneurship -from public and private programs- as well as targeted initiatives for entrepreneurs, women and young unemployed, and the development of modern alternative financial instruments. The existence of a critical mass of export-oriented firms can contribute to the restructuring of the national production system and become the driving force for economic growth and improved competitiveness of the Greek economy. However, extroversion is often seen rather as a desirable, nice to have option, in order to cope out with the local difficulties and not a concrete and cohesive strategy. However, this process requires business skills at various levels (organizational, human resource, networks and others) and products / services of high value added which can attract sustainable external demand. 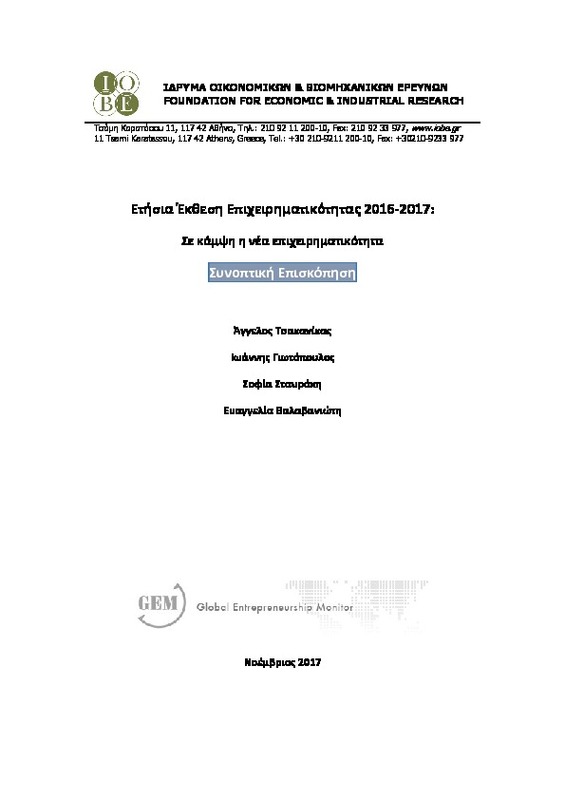 Based on an econometric analysis on GEM data for Greece during 2004-2016 we conclude that export orientation of early stage entrepreneurship in Greece is positively related to entrepreneurs familiar with business models, who develop innovative products / services using the latest technology, but also have a stronger fear of failure. However, the effects from these determinants differentiate with age. The empirical findings indicate that familiarity with business models facilitates extroversion in young and middle aged entrepreneurs, but does not affect substantially the elderly entrepreneurs. Finally, the degree of innovation facilitates export expansion in all age groups examined, yet the effect is stronger in younger and middle-aged early stage entrepreneurs. In Greece, the percentage of the population aged 18-64, which in 2017 was at the early stages of entrepreneurial activity (including self-employment), dropped at 4.8% (approximately 320 thousand people) from 5.7% (approximately 380 thousand) in 2016. This rate is the lowest ever recorded (2003-2017: 6.9%) and well below the average level of “innovation-driven economies” (2017: 9.2%). Therefore, it seems that despite the gradual stabilization of the economy during 2017, uncertainty remained strong and affected the level of early stage entrepreneurship. At the same time however, a small increase in the supply of waged employment was recorded, while unemployment declined. The percentage of population aged 18-64, which in 2016 was at the early stages of entrepreneurial activity (including self-employment), dropped at 5.7% (approximately 380 thousand people) from 6.7% (450 thousand people) in 2015. This rate - which is among the lowest recorded (2003-2016: 6.9%) - is below the average level of “innovation-driven economies” (2016: 9.1%), i.e., the majority of developed countries around the world, including Greece. Therefore, despite the stabilization of the economy in 2016, uncertainties remained strong affecting thus the level of entrepreneurship.